Check out Tobi's Gidley High Rise Bodycon Skirt With Seaming and Step Hem A good denim skirt goes a long way. Get the Gidley Vintage Wash Denim Skirt to step up all your casual 'fits. 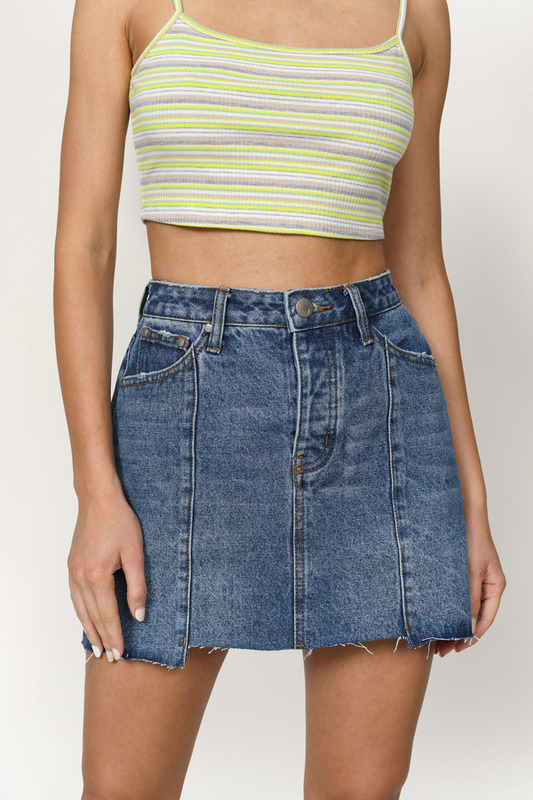 This stretch denim skirt features a step hem with contrast stitching, high waisted construction, and a gorgeous vintage wash. Pair this mini step hem skirt with a mock neck bodysuit and booties. A good denim skirt goes a long way. Get the Gidley Vintage Wash Denim Skirt to step up all your casual 'fits. This stretch denim skirt features a step hem with contrast stitching, high waisted construction, and a gorgeous vintage wash. Pair this mini step hem skirt with a mock neck bodysuit and booties. Vintage wash modeled on a size Small.